Emula is on the way! 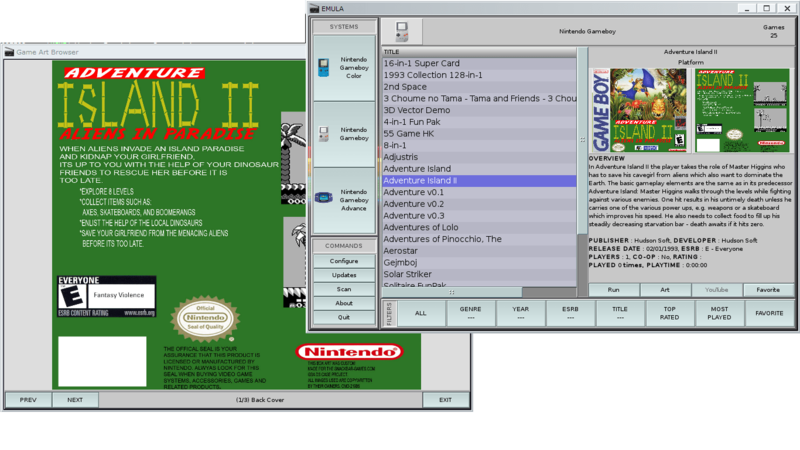 And here is my latest progresses on the universal Emulator Laucher I’m working on. The core of this application is ready and on Windows it’s working without issues, I just need to refine some parts and optimize the code here and there, but today I tried it on AROS, on Icaros Desktop to be precise. After having configured the needed parameters to unarchive zipped roms and to download and run the needed emulator it finally worked without problems! That means that there are no bugs on the core: I’m happy! I’ve also tested the databases update process and it also worked out of the box. Actually I’ve almost finished the Game Boy database, this database will allow users to scan their rom sets so Emula will be able to recognize roms despite of rom names or regions. The magic happens because Emula uses the rom crc and the rom size for identification and this is great because the user can run the scan and go to have a break because using this method no multiple/ambiguos results will never be prompted! Next time I will try to post a short video of Emula running on AROS so stay tuned!